Utopian Brewing Limited have contracted with Honiton based supplier, Vigo Limited, to supply and install their new 35 Hectolitre brewery. The chosen configuration is based on a 3 vessel brew house, with a unique design by Brewing Services Ltd based around a single Mash Tun/Lauter Tun and two Coppers to provide both flexibility and allow multiple brews per day in conjunction with 12 fermentation and conditioning tanks and all associated equipment. The design has scope for the addition of a further Mash Tun/Lauter along with further Conditioning Vessels in the future to support annual production of over 16,000 hectolitres. 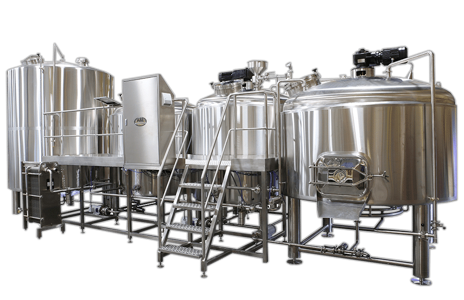 The brewhouse equipment is manufactured by Vigo’s US partner American Beer Equipment (ABE). The selection decision followed a detailed competitive tender process by the company, ably assisted by David and Rob Smith of Brewing Services Ltd.
Brewing Services Ltd were chosen as the consultants for the project in 2017 and have worked closely with Utopian Brewery on the design and layout for the brewery and with the architects on the conversion of the farm buildings to provide a splendid new home for the brewery along with a visitor centre to allow visitors to not only sample the beers but watch them being brewed from an observation gallery situated in the heart of the brewing complex. Richard Archer co-founder and managing director of utopian commented: “Having the services and experience of David and Rob alongside me has also proved to be a very valuable asset”. Once up the brewery is up and running, Brewing Services Ltd offer their on-going Brewing & QA Service. This service aims to provide much needed technical support and assistance combined with regular on-site monitoring of brewery hygiene and efficiency along with product testing to ensure the optimum quality and consistency of the beers leaving the brewery. Hand in hand with the Brewing & QA goes the on going Training and development for brewery staff aiming to fulfil their full potential as brewers. For more information or a chat on your particular brewing requirements, please come and visit us on Stand 94 at BeerX in Liverpool, March 13-14.